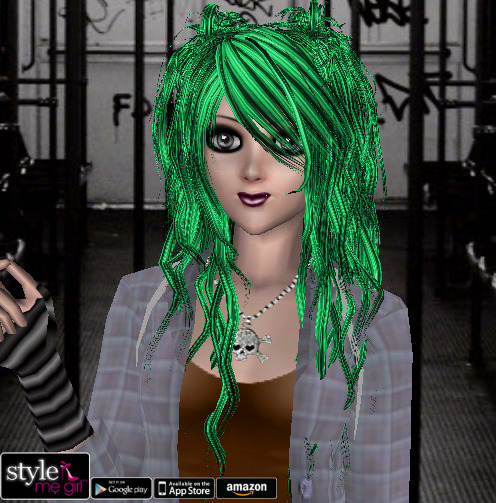 Style Me Girl Level 19 - Joyce - Grunge | I Style Me Girl! @Avri Watson - I am not sure, but I believe the green hair was a silver coin item in the Boutique. But I was still able to get three stars on this level (with all boxes checked too!) on this level using these same items and Joyce's own short dark purple hair, and without using the spiderweb earrings also. but why me girl glamour is nothing a free version? I couldn't find the shoes or the hair. I'm running 3 different versions of me girl and they release different items at different times. They change releases too. I didnt get the cheetah pants until after the animal girl shoot but i had it on my old device about a year ago. I got 3 stars using the black converse with white skulls and the brown hair in a messy bun held up by a blue band. Hope it helps! I had everything they had but I got Fair? Why?? Finally figured out about the hair problem! You get it after you unlock level 22, Haute Couture with D'Are. But it's perfectly fine to use the purple hair. i cant get past the level, but ill use this advice. thx.